meats and seafood were supplied by the packing houses. and distant markets, notably Baltimore, these being rushed to Deer Park in refrigerated cars or by express. Although sometimes embarrassed by "Local Option," the hotel due to its status as a club was able to operate legally its cafe for the slaking of its patrons' thirst after a session on the golf links, the tennis courts or elsewhere. All passenger trains stopped at the Deer Park Hotel Station which had been provided from the very beginning for the convenience of the guests. Through Pullman service to all principal cities enabled business men to spend most of the week at their offices and the week ends with their families at Deer Park. 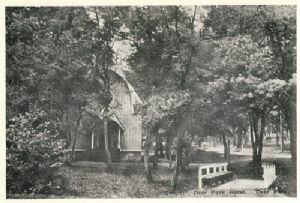 The Episcopal Chapel located on the grounds of the Deer Park Hotel. Opened in summer for the convenience of the guests. Courtesy of R. B. Garrett.